Apparently I am stuck on stocking stuffers. The reason for this could very well be that I do not have a stocking or anything to stuff it with prepared for Vlad yet. Do I go cute, do I go cool, do I go traditional, do I think out of the box? Part of my problem for finding him a stocking stuffer is I keep finding stocking stuffers for myself. I hate how I end up in the women’s section of every website rather than the men’s. Planned, nah, not me! I now found another stocking stuffer that could replace the orange that I typically got and never ate. 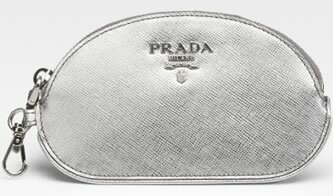 The Prada Key Ring Pouch is small, cute, and made with silver leather and a key ring. Dimensions are 4Â½”W X 3″H. Buy through Saks for $195.